Johann Sebastian Bach (picture), widely regarded as the greatest of all composers of music for Christian worship, was born in 1685 in Eisenach (note: music on this page starts automatically), Thuringia, Germany, into a family of distinguished musicians. In 1708, shortly after marrying his cousin, Maria Barbara Bach, he became court organist to the Duke of Weimar, where he wrote his principal compositions for the organ. In 1717 he became music director (Kapellmeister) to Prince Leopold of Coethen. In 1720, his wife died, and in 1721 he married Anna Magdalena Wuelcken, for whom he composed a famous set of keyboard pieces (Notebook for Anna Magdalena Bach--see References, right). 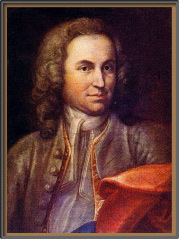 From 1723 until his death in 1750 he was at Leipzig, where he taught, conducted, sang, played, and composed. He had 20 children, of whom nine survived him, four of whom are also remembered as composers. In addition to his secular music, Bach wrote a considerable amount of music for worship. He drew on the German tradition of hymn-tunes, and arranged many of them as cantatas, with elaborate choir settings for most stanzas (see Definitions, right), and a plain four-part setting for the final stanza, to be sung by the congregation with the choir. Normally each stanza is unique, using the melody traditional for that hymn, but with variations, particularly in the harmony, that reinforce the meaning of the words of that stanza. He wrote altogether about two hundred cantatas, including at least two for each Sunday and holy day in the Lutheran church year (matching the subject of the cantata with that of the Scripture readings prescribed for that day). Two of the better known are "Christ lag in Todesbanden" (music starts automatically) (Christ lay in the bonds of death"), based on an Easter hymn by Martin Luther; and "Jesu, meine Freude" (music starts automatically) (Jesus, all my gladness). It is an ancient custom that during Holy Week the Gospel readings shall be from the accounts of the Passion (=suffering and death) of Our Lord, and that, where possible, these accounts shall be read, not by a single reader, but with the speeches of different persons read by different readers (and the crowd by the choir or the the congregation). This may be said, or chanted to a simple tune. Bach wrote, for the St. Matthew Passion (see Audio files, right), and again for the St. John Passion (see Audio files, right), an elaborate musical setting, with the Gospel narrative sung by a soloist, with the dialog by other singers, and commentary by the choir in the form of hymns and more elaborate pieces. He also wrote a setting for the traditional Latin Liturgy, his famous B Minor Mass. The Liturgy (or Order for the Celebration of the Lord's Supper and the Administration of Holy Communion, Commonly Called the Mass) is divided into the Ordinary (the parts that are the same every time) and the Propers (the parts that vary from day to day, such as the Bible readings). The choral parts of the Ordinary include the KYRIE ("Lord, have mercy" or "Hear us, O gracious Lord"), the GLORIA ("Glory to God in the highest," based on Luke 2:14), the CREDO ("I believe in one God, the Father Almighty..."), the SANCTUS-BENEDICTUS ("Holy, Holy, Holy" and "Blessed is he who comes in the name of the Lord", based on Isaiah 6:3 and Matthew 21:9), and the AGNUS DEI ("O Lamb of God," based on John 1:29). Bach wrote choir settings for these (in case anyone is wondering why a devout Lutheran would write choir settings for a Mass, I point out that the language of the Liturgy is ancient, and contains nothing not taught by Lutheran and Methodist and Presbyterian churches), and his work is not simply a matter of supplying pleasant-sounding melody and chords. For example, in the Creed, there occurs the line, "And I believe one holy catholic and apostolic Church." In Bach's setting of this line, there are two melodies sung by the choir simultaneously. One is a traditional plainchant melody, most frequently sung by Roman Catholics. The other is a Lutheran chorale melody. The two melodies are interwoven, and they harmonize perfectly. Bach was not just a musician. He was a Christian, and a preacher of the Gospel. George Frederick Handel (Georg Friedrich Händel) was born at Halle in Germany in 1685. He originally studied for the law and then began to write operas. He moved to Italy in 1706 and to England in 1710, where in 1726 he became a British subject. From operas, Handel turned to the writing of oratorios, works with a religious theme to be sung by soloists and a chorus. His greatest work, The Messiah, was first performed in Dublin in 1741. The words are Scriptural passages from both Testaments dealing with the birth, death, and resurrection of Jesus. G B Shaw referred to it as "the hymn that can make atheists cry." (My advisor, Herbert Feigl, an atheist of Jewish ancestry, loved it and went to church whenever it was to be sung.) In most large towns in the English-speaking world, it is performed every Christmas and Easter. Handel died 14 April 1759. Henry Purcell (10 September 1659 (? )– 21 November 1695), was an English organist and Baroque composer of secular and sacred music. Although Purcell incorporated Italian and French stylistic elements into his compositions, his legacy was a uniquely English form of Baroque music. Purcell was born in Westminster (now part of London) into a family of musicians. His family was connected with the Royal Court, and Henry was a chorister in the Chapel Royal until his voice broke in 1673. In 1679, his teacher, Dr. John Blow, who had been appointed organist of Westminster Abbey in 1669, resigned his office in favour of his pupil. Purcell now devoted himself almost entirely to the composition of sacred music, and for six years severed his connection with the theatre. However, the composition of his chamber opera Dido and Aeneas, which forms a very important landmark in the history of English dramatic music, has been attributed to this period. Soon after Purcell's marriage, in 1682, on the death of Edward Lowe, he was appointed organist of the Chapel Royal, an office which he was able to hold simultaneously with his position at Westminster Abbey. For some years after this, he was busy in the production of sacred music, odes addressed to the king and royal family, and other similar works. In 1685, he wrote two of his finest anthems, "I was glad" and "My heart is inditing", for the coronation of King James II. One of Purcell's most elaborate, most important and most magnificent works was a birthday ode for Queen Mary. It is titled Come ye Sons of Art, and was written by Nahum Tate and set by Purcell. Purcell's Te Deum and Jubilate Deo were written for Saint Cecilia's Day, 1693, the first English Te Deum ever composed with orchestral accompaniment. Almighty God, beautiful in majesty and majestic in holiness: You gave to your musicians Johann Sebastian Bach, George Frederick Handel, and Henry Purcell grace to show forth your glory in their music. May we be also moved to sound out your praises as a foretaste of your eternal glory; through Jesus Christ our Savior, who lives and reigns with you and the Holy Spirit, one God, for ever and ever. Amen.